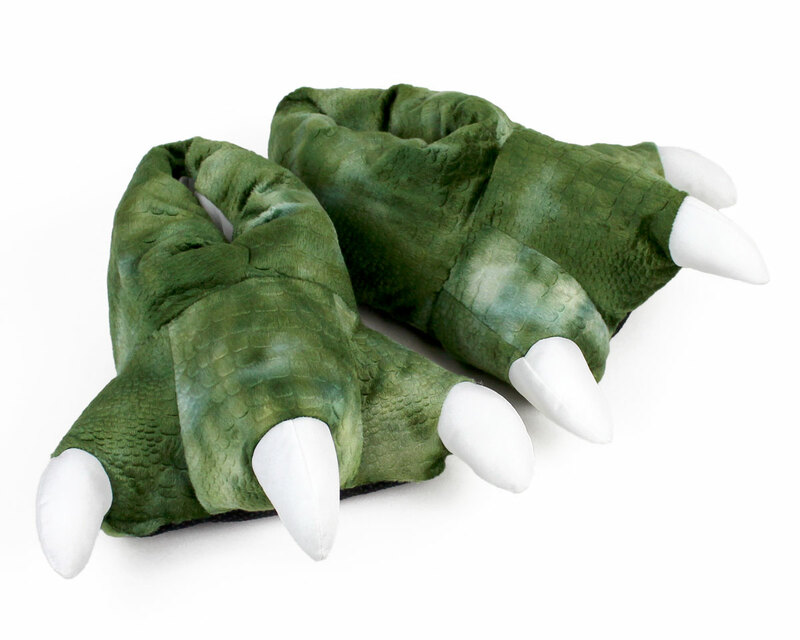 These ferociously fun Dinosaur Feet Slippers include a sound feature that activates every three steps to let out a dinosaur ROAAAARRR! 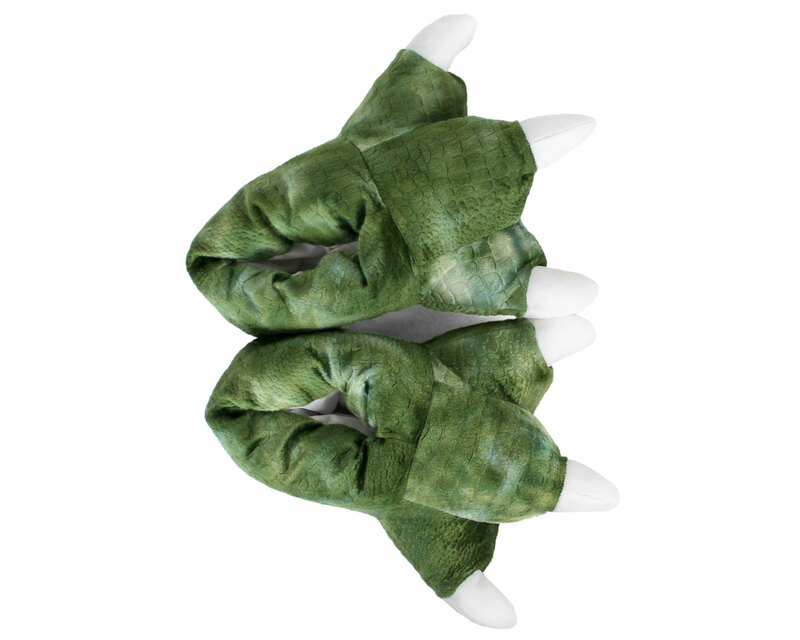 Made with green scaly-textured fabric and three white claws on each foot. 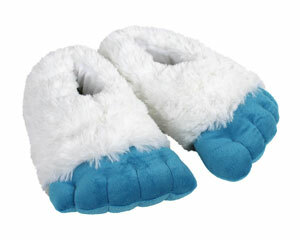 These wildly amusing slippers are also super comfy with soft plush uppers, foam footbeds and non-slip grips on soles. 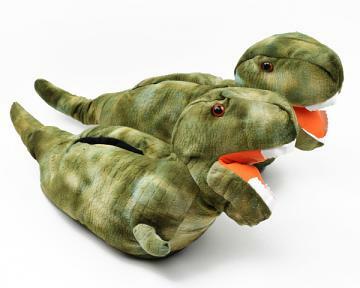 These slippers are an ideal gift for the dino enthusiast in your life and perfect for giving your family pets a prehistoric surprise! They were perfect for my husband's anniversary gift. I worried they would be small but they fit fine. Advantages: Quick delivery, good quality. I went to a girls slipper party...they were a hit!! Little expensive, but good quality! Thank uu!! These are very cool. Got them for my nephew and has has not taken them off his feet. Disadvantages: Child will not take them off. Very cute and comfortable slippers. However the noise making is annoying. 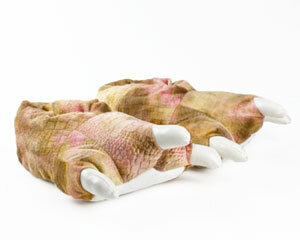 Three dinosaur growls with each step on each foot. So much noise that it doesn't sound like much. And no option to turn it off. I am going to have to cut out the noise maker. Advantages: Comfy, Cute, Soft. Quick shipping. Disadvantages: Noise doesn't sound authentic and is very annoying. I thought my son would like them because he loves dinosaurs. He told me these were “definitely theropods.” If only I could him get as excited about cleaning up his toys… But let me tell you, if you want to complete a kid’s fun with building blocks, these slippers are what you need. My son and daughter take turns being the “monster” stomping through a “city” they made. It’s hysterical. No regrets whatsoever. Check out was easy. Product arrived in a brief time period and was completely functional. I’m satisfied with my purchase. Protip, the sound device is up front, so if you monstermash around on your heels, it wont roar. Once I figured that out I was a happy customer. Fast shipping too.